About Huggies Newborn Diapers - Extra soft like cotton keeping your newborn's skin soft and dry. You will receive the sample packet of Huggies Newborn Diapers(2 pack of 2). 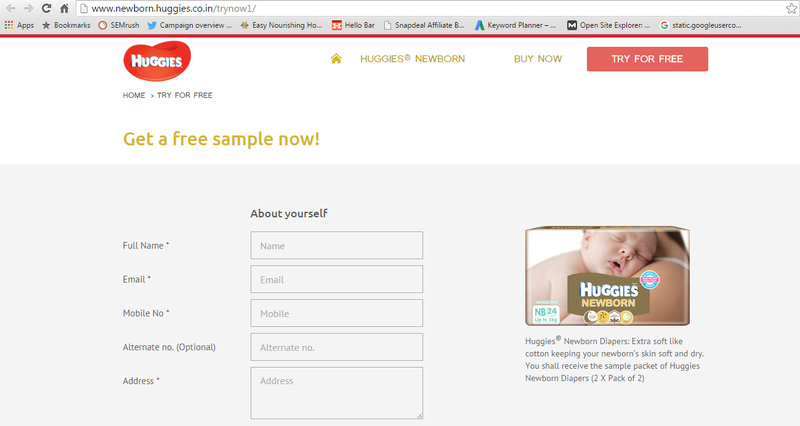 How to get Free Huggies Diapers sample pack? 1. Visit Huggies Free Sample offer page here. 2. Enter your name, email id, mobile number, alternate number(optional), address, Baby's birthdate/due date(Should be the date of a newborn for born babies). 3. Tick the 'I'm not a robot' option. 4. Have the below check boxes checked. I agree to the T & C of use. 6. You will receive an OTP to your mobile. 7. Enter the OTP and confirm. 8. You will get the below message. 'Thank You for trying out Huggies Newborn Diapers.